Exercise TALISMAN SABRE 2017 (TS17) is a biennial combined Australian and United States (US) training activity, designed to train our respective military forces in planning and conducting Combined Task Force operations to improve the combat readiness and interoperability between our respective forces. This exercise is a major undertaking that reflects the closeness of our alliance and the strength of the ongoing military-military relationship. TS17 will involve a Command Post Exercise (CPX) which incorporates simulated forces and scenarios, and a Field Training Exercise (FTX) which will see manoeuvring of extensive forces in Australia. The Talisman Sabre series of exercises is a major Australian and United States military training exercise focused on the planning and conduct of mid-intensity “high end” warfighting. 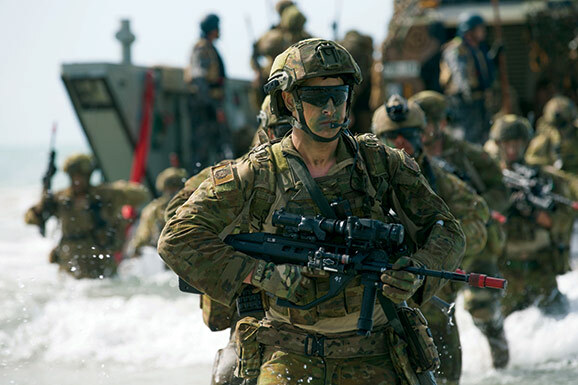 This will be the seventh time the Exercise has been conducted and will involve over 30,000 Australian and US defence personnel. TS17 will incorporate force preparation activities, Special Forces activities, amphibious landings, parachuting, land force manoeuvre, urban operations, air operations, maritime operations and the coordinated firing of live ammunition and explosive ordnance from small arms, artillery, naval vessels and aircraft. The majority of TS17 field training exercise activities will take place in Shoalwater Bay Training Area, near Rockhampton in Central Queensland. Field activities will also occur in Mount Bundy Training Area, south of Darwin. Personnel and assets will also operate from Australia in Darwin, Townsville, Brisbane and Canberra; and from the United States in Hawaii, Indiana, Virginia, Colorado and Washington during the period June/July 2017.